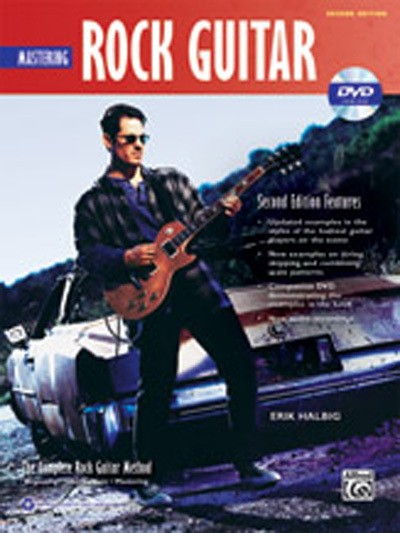 This book and DVD-ROM is perfect for guitarists who have been playing for a while and are ready to expand their skills and technique. It includes in-depth lessons on pentatonic extensions, the major and harmonic minor scales, arpeggios, triads, chords derived from scales, and modes. Also included are technique-expanding exercises for legato playing, speed picking, intervallic playing, tapping, sweep picking, and bending. For those who truly want to stand out and become exceptional rock guitar players. This revised edition features new examples on string skipping and combining scale patterns, new examples in the styles of the hottest guitar players on the scene, new audio recordings, and a brand new video demonstrating the examples in the book. The video teacher, Jared Meeker, is a rock guitar master with an entertaining and relaxed approach that makes learning fun and easy. If you have completed Beginning Rock Guitar and Intermediate Rock Guitar, this is your best next step.